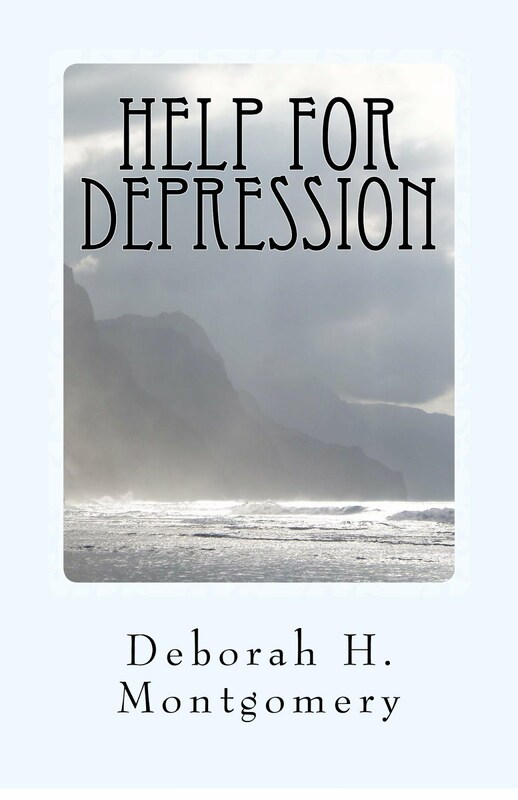 To enter my *** GIVEAWAY *** leave a comment at my post here. My daughter recently discovered a chocolate chip cookie recipe on Pinterest to end all recipes. Some things that make them so good: these gourmet cookies take cake flour and bread flour, instead of regular all-purpose flour. 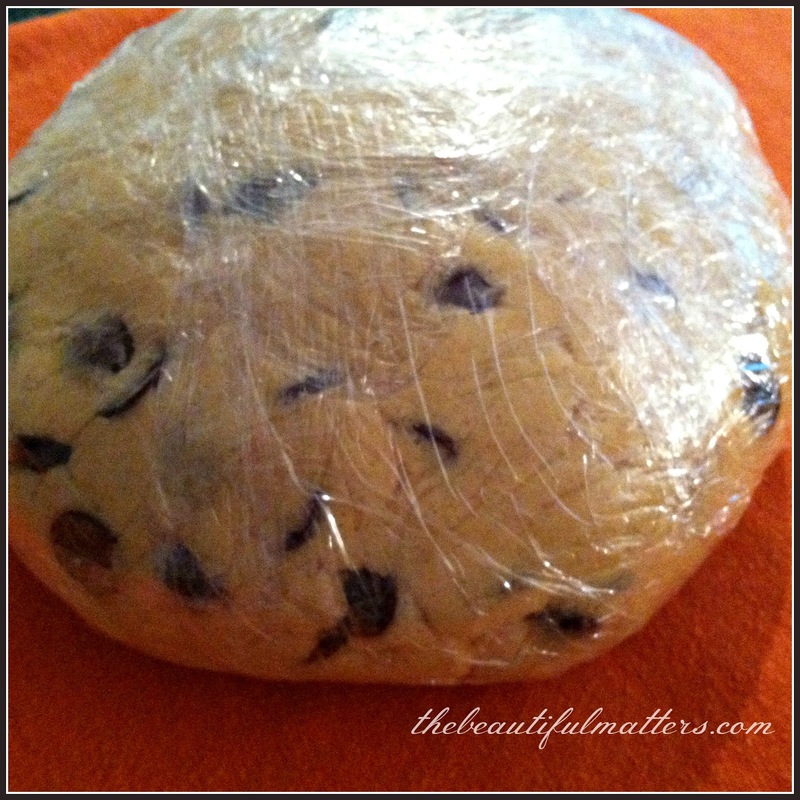 The dough needs to be refrigerated at least 24-36 hours before baking. No Tollhouse or no-brand chocolate; use Ghirardelli 60% cacao chocolate chips. Sprinkle them with coarse salt (like Kosher) before baking. I'll post a link to the recipe further down. 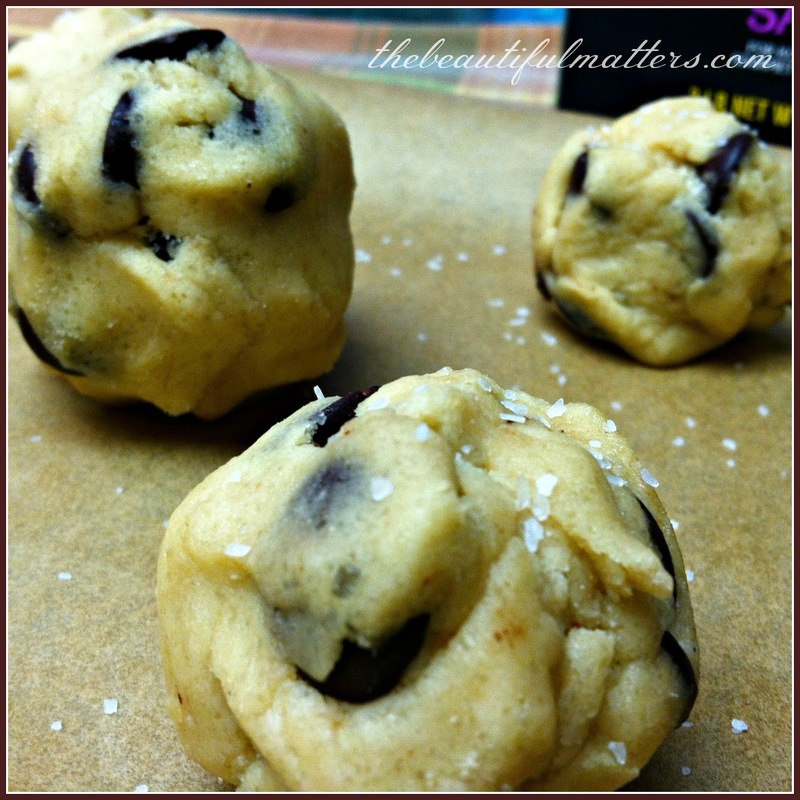 The recipe says to use 1/3-cup measures to measure out the dough. That's a 5-inch cookie! My daughter didn't make them that big. She was taking them to work for a party, but was nice enough to leave some for Mr. Beautiful and me. I am one that thinks a piece of pie or a couple cookies, with a cup of coffee, is a good breakfast. Lest you think all I do is eat carrot cake and pancakes and chocolate chip cookies . . .
Ha! It just struck me that the picture of the book Sense and Sensibility is perfect for this post! Fruit and vegetables (Sense) and chocolate chip cookies (Sensibility). There's room for both. Oh wow! Those look delicious! I will put them on my mental "to try" list! Yum! Yes, I was noticing a theme of deliciousness with all those yummy recipes you've shown recently. I agree a sweet with coffee is a lovely breakfast. Why did it take until this decade before we discovered how fantastic it is to sprinkle a little kosher salt on baked goods? Lovely post. And I like your breakfast idea....cookies and coffee. You're very smart. :) Must try the cookies as well, but know ours will go in a heartbeat. Many mouths, you know. I KNEW I liked you, Deborah! 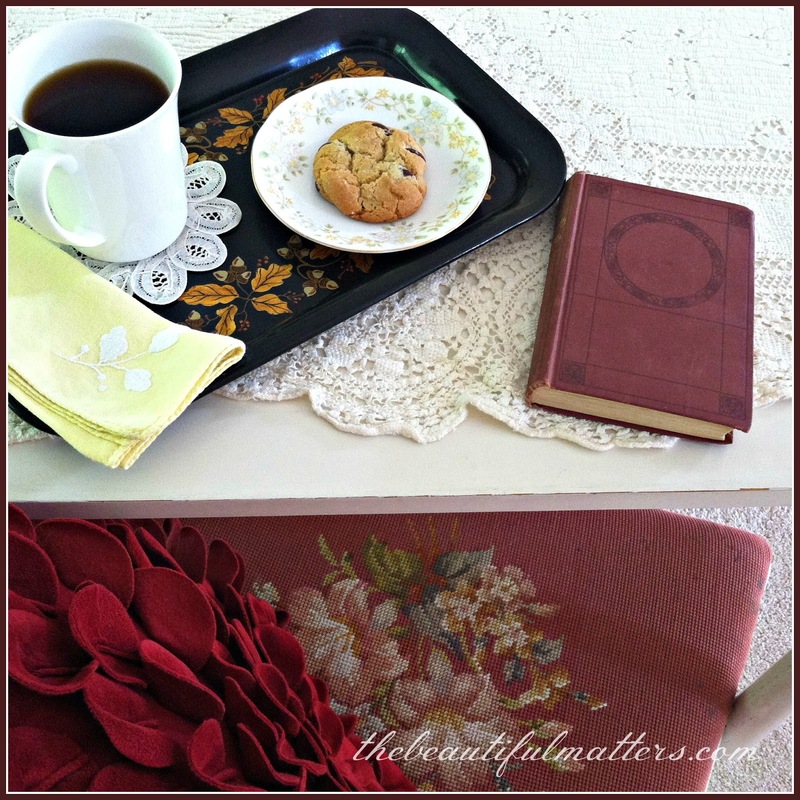 I love cookies and coffee in the morning - only thing better is cookies and tea in the afternoon! I am sooooo going to try this recipe. I haven't made ccc in a long long while. Now that it is finally cooling down I am getting in the mood. I don't crave chocolate when it is so hot. 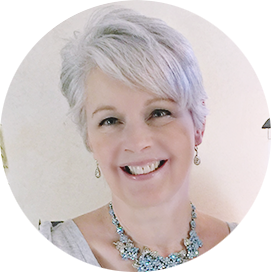 Oh my gosh- the recipe writer lady blog post link? That has to be one of the cutest things I have ever read on a blog. It was so cute I read it out loud to my husband. Thanks - what a chuckle and a hoot! My test for whether or not a recipe is truly tempting is the question 'does this make me want to take the butter out of the fridge to soften?' Yes, this does!! 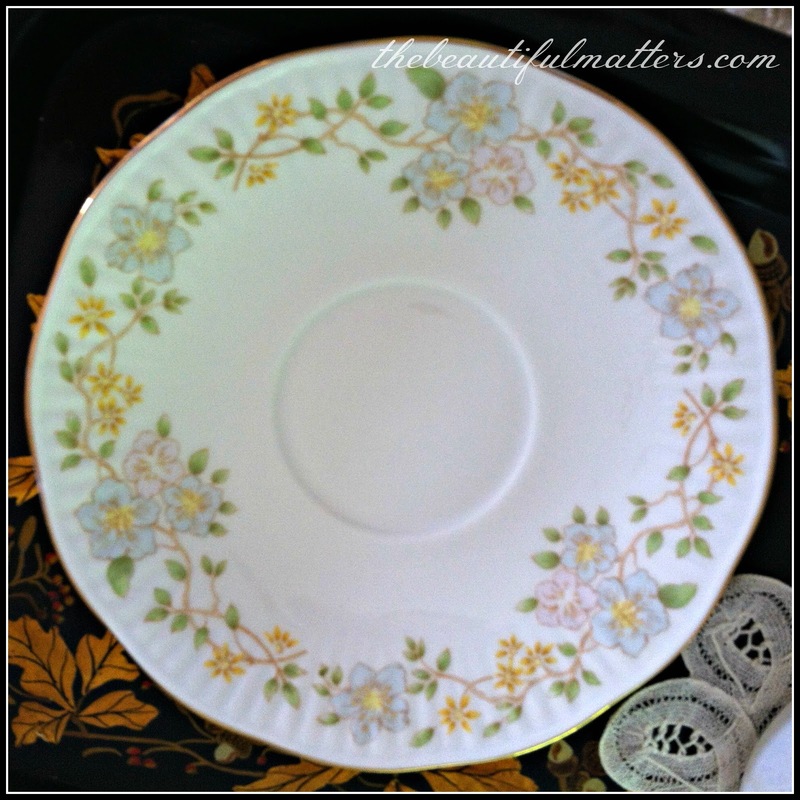 LOVE the handpainted tray by your dear Mother! Hugs and happy new week to you. We don't have a stand mixer either, and just mix them by hand. I somehow deleted these comments when I meant to publish them. Arg . . . so I’ve pasted them from my email box . . .
What a lovely presentation on the tray your grandmother painted, just beautiful. I must give those cookies a try. I love the texture of cake flour in some things, but the idea of bread flour as well sounds quite interesting. 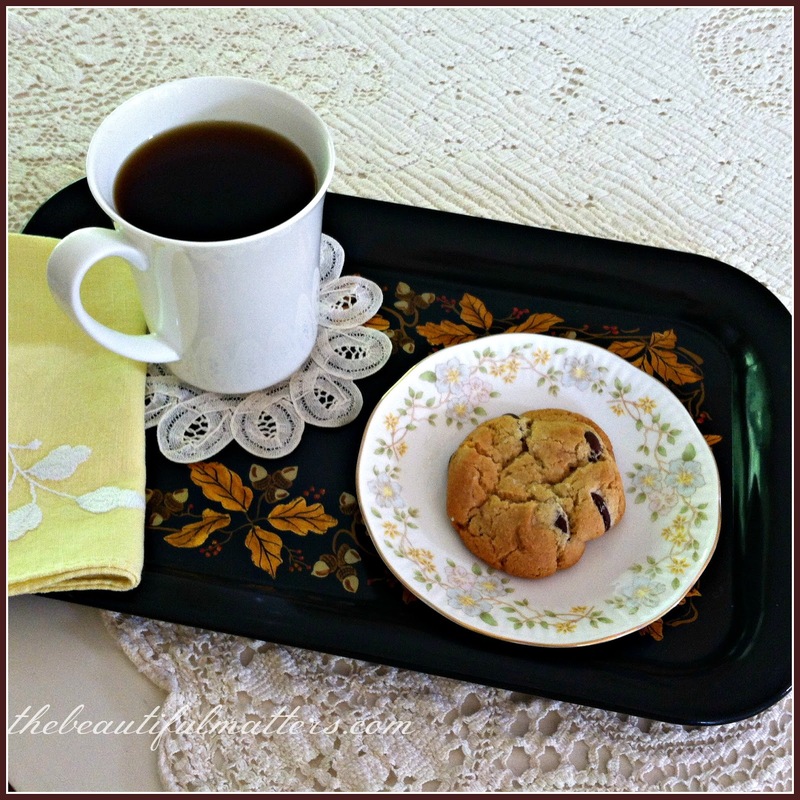 Those cookies look delicious and the tray is a real delight. Oh wow what delicious looking cookies-your daughter is a great little cook! I just love the tray your grandmother painted Deborah-beautiful and so professional. Pinning! Funny post, and beautiful tray painting. Good Monday Morning! The cookies look delicious. The tray is such a treasure. Hope you have a nice day! Oh how yummy. I love a bit of salt with my chocolate. The pears make for a very beautiful photo. Hi, Deborah. Those cookies look incredibly delicious! I love cookies and just have to try that recipe, so I thank you and your daughter for recommending a great recipe. I agree with you and think a cookie and coffee is a great breakfast (but I do eat my fruit and veggies too). Those cookies sound wonderful and Hubby would certainly enjoy them with his tea. He likes something sweet with his coffee and tea. Me, I usually prefer to just sip my hot beverage without the sweet. But I make them for him. Your grandmother painted a lovely tray and it's wonderful that you have it. Thank you for joining me for tea and have a beautiful day. 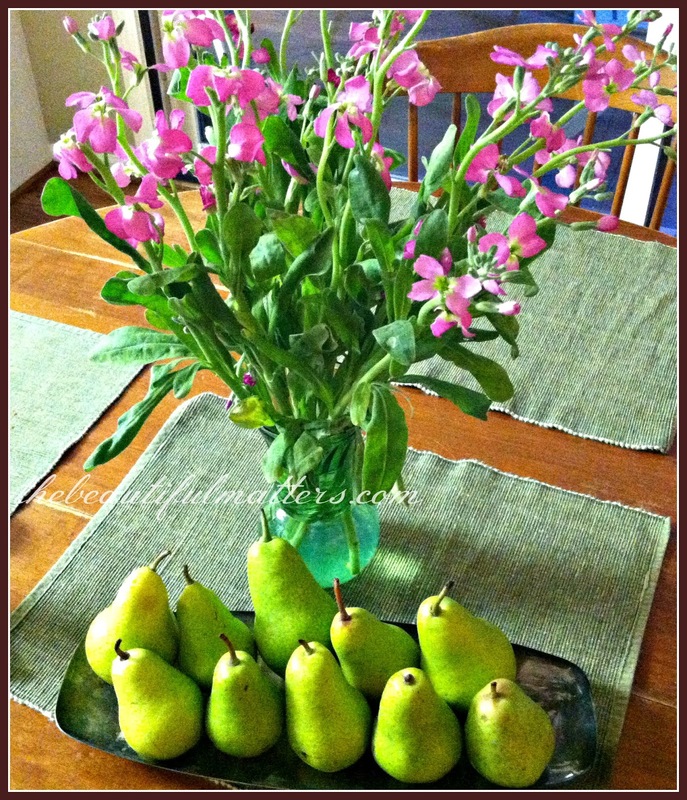 Love the pears - they look so pretty on the plate. Love and hugs to you! First of all, I love the tray that your grandma painted, Deborah. Isn't it lovely? I must admit that I love when cookies are large and will be going to the link to view the recipe. They look scrumptious! Hi Deborah, now don't those cookies look delicious?? Being gluten sensitive I could sub the flour for rice flour. The texture is a bit different but still good. Love the tray your grandmother hand painted. She was very talented . Love the pretty pears on the tray too. Your posts just lift my day. 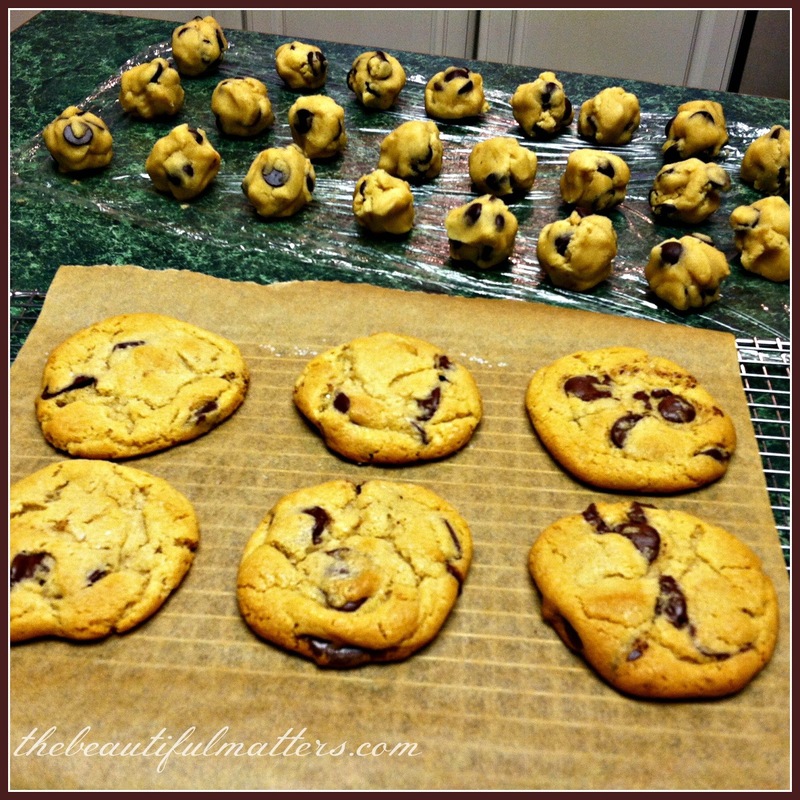 I used to have what I called the world's best chocolate chip cookie recipe. They called for canola oil instead of butter or shortening. I made them for 20 years, and they were the best cookies ever! Then we moved across the country, and for whatever reason (must be climate or elevation), they are just not the same. All that to say, I have come to the place of being willing to look for a new recipe, so I'll be trying yours. Thanks! Yes, those look like yummy chocolate chip cookies and the fruit looks good too...I think you are right, there is room for both.. Blessings! Mr. Beautiful just rolled his eyes at first, but I'm thinking he secretly likes it. Of course, he wouldn't admit that :) When I just asked him, he said it was better than Mr. Matters! 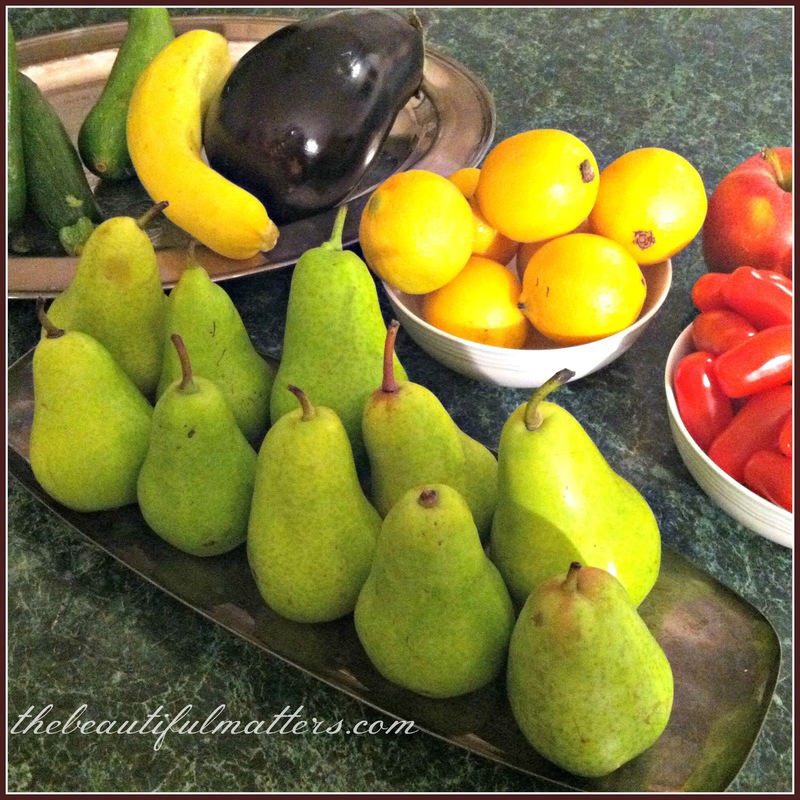 Enjoyed this whole post, and strangely my favorite part is the tray of pears. Thanks for sharing that recipe. I look forward to making them! They look great. Your table looks lovely and inviting. I belong to a Jane Austen group, so seeing the book made me smile! I just pinned your recipe. I am the "Cookie Lady" of my lane so all of my neighbors will love you! The cookie recipe looks so good and interesting and thanks for sharing. Enjoy your week! Those cookies look scrumptious!! Chocolate chip cookies have Always been a favorite at our house. While the kids were still at home, we were never without homemade chic. chip cookies...I guess they became a staple. Deborah, I am in awe of your Grandmother hand painting that tray! What a talent, it's beautiful! your cookies look amazing!! I haven't met any chocolate chip cookies I have liked! LOL! Oh my, you had me with coarse salt. Salt and sugar, yum! 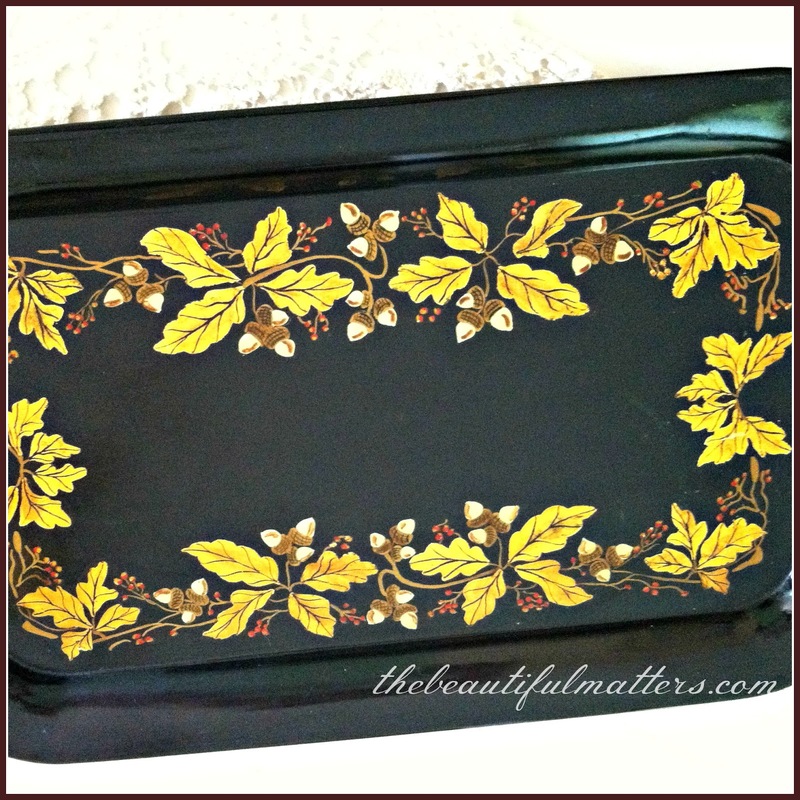 The tray your grandmother painted is gorgeous and so perfect for Fall. Just so you know, that is my idea of a perfect breakfast. But I pop a Diet Coke instead of coffee. lol! Good thing I don't bake daily or I'd never eat a healthy breakfast. I did have a yogurt today. Thanks for sharing with SYC. Oh, I'm saving this one for Mr G. He's the cookie maker in our home, actually uses Ghirardelli chips for his chocolate chip cookies. LOVE the sprinkled Kosher salt on top. Oh, you are my kind of breakfast girl! Definitely a sensibility kind of girl! I bet the cake flour made these really tender. I think I will have to try them. I am always chiding hubby for buying be-sgusting (as my 2 year granddaughter said yesterday) store bought chocolate chip cookies. I always beg him not to so lately I have been leaving cookie dough unbaked in the fridge so he can get his fix without eating those tasteless things! OMG!, sweet lady this cookies look awesome! I just got back from visiting our DD Alexandra and all I find is yummy sweet things and I ate a lot cause we went out a few times, lol! Thanks again for the beautiful giveaway...you are one generous lady! I love to see my teacup and have some green tea in it, as I drink lots of it all day! Have a great weekend up ahead. 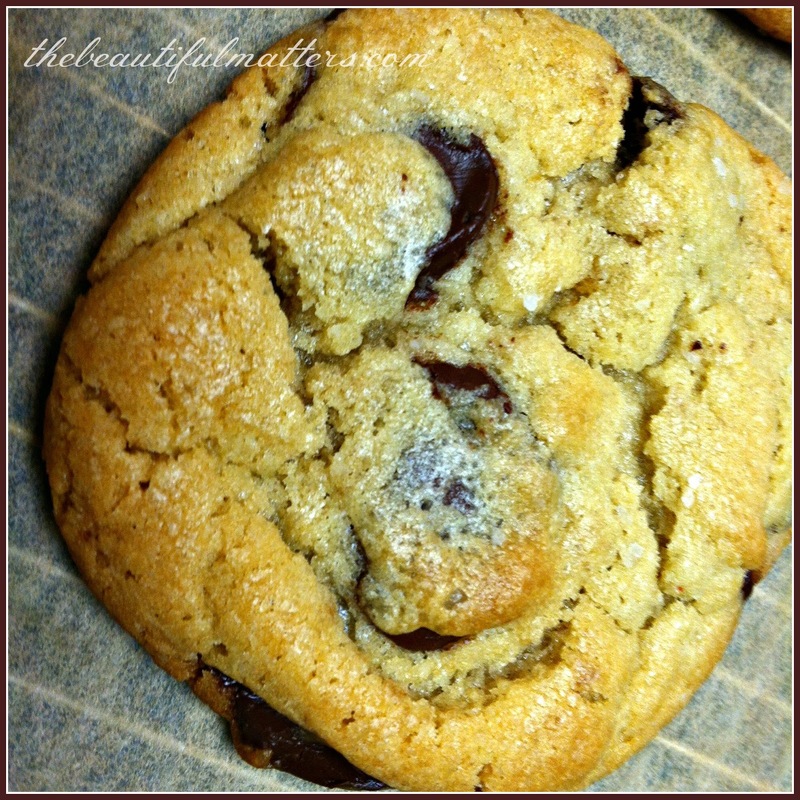 Well, if one is not crazy about cookies, (like moi), this 'very best chocolate chip cookie ever' recipe would surely make a convert out of anyone! Like you, coffee and a piece of homemade cake or muffin is the breakfast of choice for this early bird blogger! I love chocolate but I've never liked chocolate chip cookies, in general. I know ... GASP! But there have been a few versions that I thoroughly enjoyed. This sounds like it might be one, as well. Sounds complicated because, by the time I want to bake chocolate chip cookies, I want them now! Say, where have you been? Enjoying September, I'm sure! They do look fantastic. 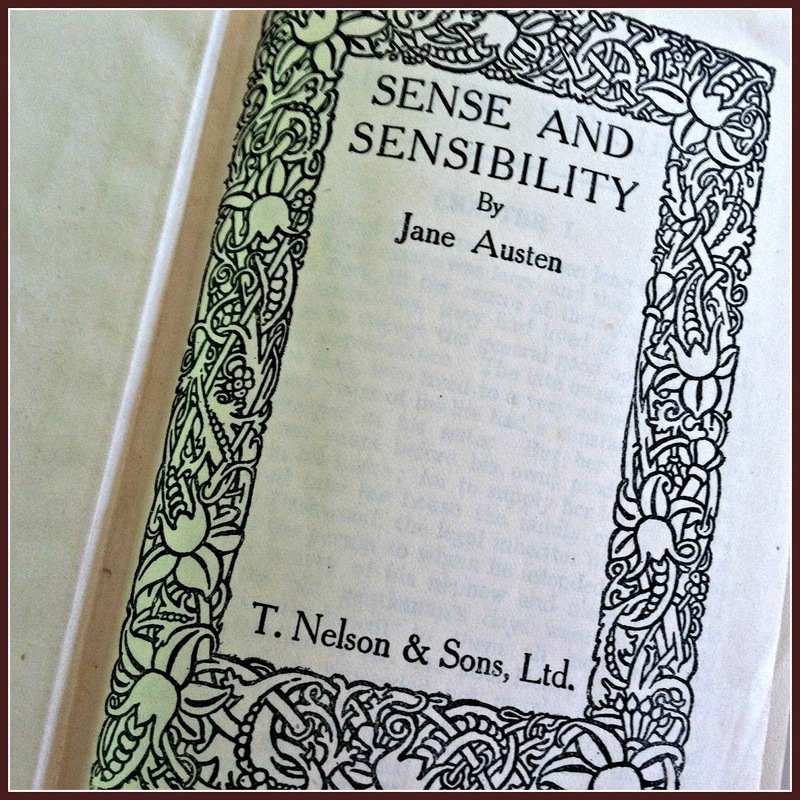 And lucky you to have that copy of Sense & Sensibility, my favorite Austen book! Chocolate chip cookies for breakfast, of course ! Especially the cookies your daughter made. Your grandmother was very talented, the tray is cheerfully lovely. I am laughing now at some of the comments regarding "Mr. Beautiful". You're so funny :) And I'm glad to know I'm not the only one who breaks cups (boohoo!!!! ), but keeps the saucer. Who could get rid of a lone saucer? Not me! And I must SAY -- just your top photo nearly undid me. I think I must make cookies tonight, but alas, I cannot wait 30 hours, I have no bread flour nor cake flour, and I only have ordinary chocolate. But I may make them anyway. Sprinkle of salt on top sounds like an idea :) What yummy things you eat. And you are ABSOLUTELY RIGHT about pie for breakfast. It's fruit. It's pastry. It's breakfast! How is it any worse than a danish, I'd like to know! haha :) Delightful!